The Autumn leaves haven't come out just yet, but I found a very nice 6.5% Suntory Akinama special brew to take me away from the cheap, but nasty taste of 7% Daiei (think Home Brand) shochu mixes I've been drinking. I was introduced to this fine beer at the last school party. I guess that some good things come out of going to unpaid teaching sessions that I actually pay for. This one has a nice malty taste, and after one or two I feel pretty good! I'll really miss them at the end of season. In preparation, I looked around for other strong beers. This one tastes like fairly ordinary draft beer, nothing to write home about, but it's nicely went to my head. I'll probably go back to shochu after the seasonal beer run is over, but this would make a quick, emergency beer fix. It always nice to have a good laugh from the bad English I see in this place. Lately there's been some great ones. Check these out.. This is Sh**ting paper? I had no idea! This is a clothing shop in Chofu. Japan's photobooks are a little different to Apple's. 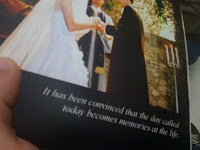 "It has been convinced that the day called today becomes memories at the life". Touching. I always like going down the rabbit Labbit hole in Shibuya. My favourite "stuffs" shop. 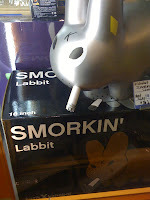 "Smorkin Labbits" were a huge hit kid's toy here. I wanted to try the video with my Nikon D5000 so for something a little different, I popped on the fisheye lens for some trippy bendy video in Shibuya. Enjoy!